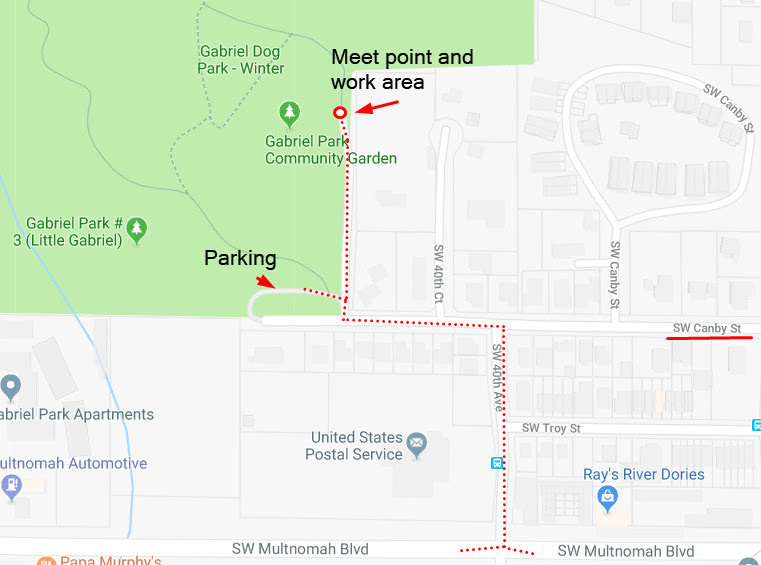 SW Trails monthly first Thursday Work Party for April 4th 2019 will be at Gabriel Park from 9am until Noon. We will meet at the Park South entrance down by the community gardens. Limited parking is available at the garden area, so it might be best to park in the south parking lot and walk down. At this work party we will be working on tread improvements, closing some social trails, possibly a new section of trail or reroute, and as it is spring there will always be brush to remove. So, lots to do. Please consider joining us out on the trail in 2019 as these work parties are designed to support a wide range of worker capabilities. We welcome all and all abilities. So give some thought to joining us or just stop by and say hi.As always our work is guided by the Portland Parks Lands Stewardship folks. and Parks will bring all the tools, gloves, and materials we need, and also, coffee, snacks, water, and usually some fruit. On these work parties it is not necessary to stay for the whole event and you can work at whatever level your skill and energy allows. It is just great to meet the neighbors and get a little trail work in. Attire should be sturdy shoes, work cloths, and it is Spring now so clothing layers and a rain jacket would be good. We look forward to seeing you out on this work party.